If you’ve got too many tomatoes on those vines, remember you can freeze them for cooking use later. Wash, remove stems, slice or cube and stash them away in the deep freeze. They won’t retain their shape, but their marvelous flavor will still be there when they thaw. If you are really ambitious, why not dry some tomatoes in the oven on some cookie sheets? They’ll be great for salads, sandwiches and pasta dishes. 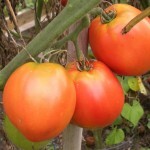 What’s your favorite tomato plant? Pam at Hidden Valley Farms in Warm Springs, Virginia, just loves Goliath and Sweet 100’s Cherry tomatoes. I’m a novice and planted by first veggie garden this year. Next year, I’ll be sure to reread the article in Fine Gardening magazine on pruning tomato plants. My plants were so leggy the tomatoes were blocked from some precious hours of sunshine. It didn’t help that I planted them too close together either. Next year …. .